It was a long-scheduled meet up that finally, the five of us were complete! Meet my friends Lani, Leira, Lariza and Vimz. 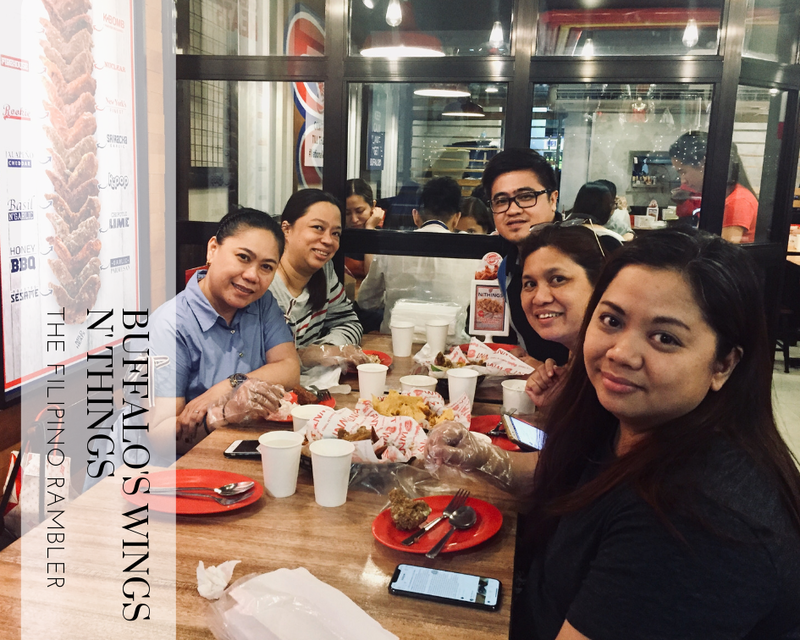 We initially gathered for coffee and some sweets but thought the night was still young and decided to fill our tummies more. 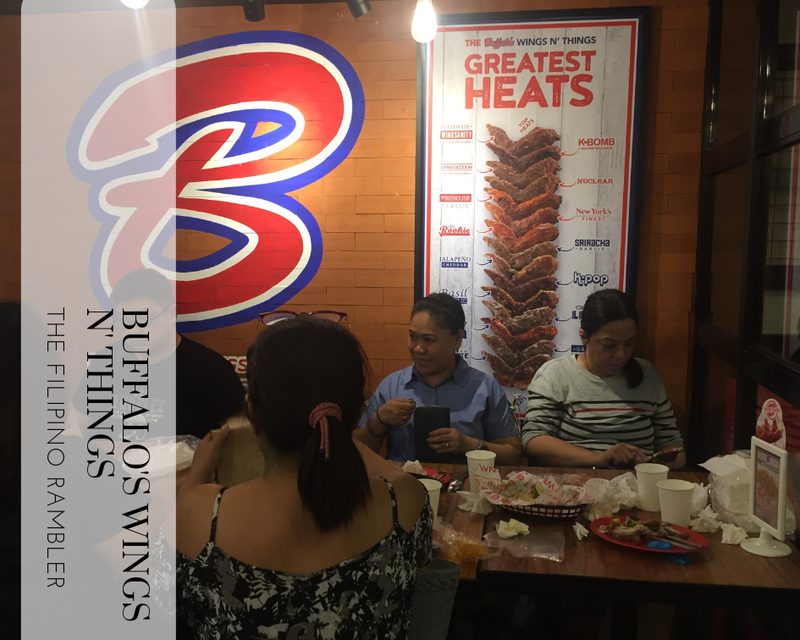 All of us craved for some buffalo wings and before we know it, we were in front of Buffalo's Wings N' Things. I always notice the long lines during peak hours at this joint and I was curious to try their offerings. It took us at least 20 minutes before we were accommodated. It's usually jam packed so prepare to wait. Since we are a group of five, we decided to get the group meal- the Grand Slam Platter. 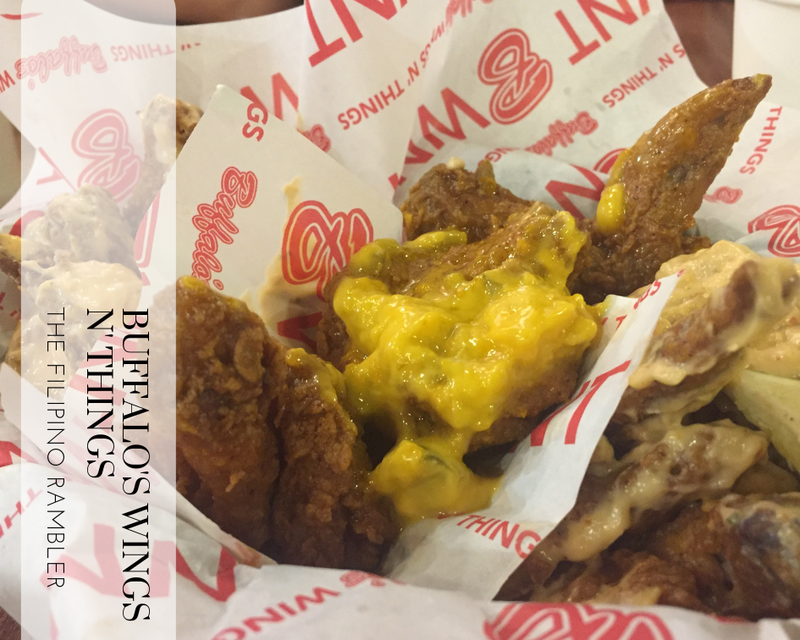 It's composed of these: Triple Sampler Champion Buffalo Wings, Triple Sampler Original Chicken Fingers, 4 cups of rice, and a choice between nachos or fries. 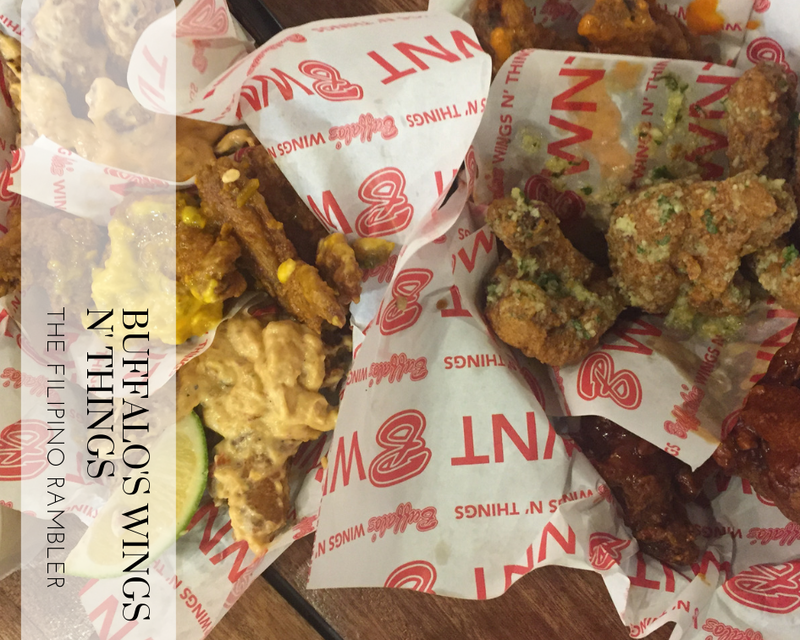 For less than hundred bucks,we upgraded the chicken fingers to another triple sampler buffalo wings. 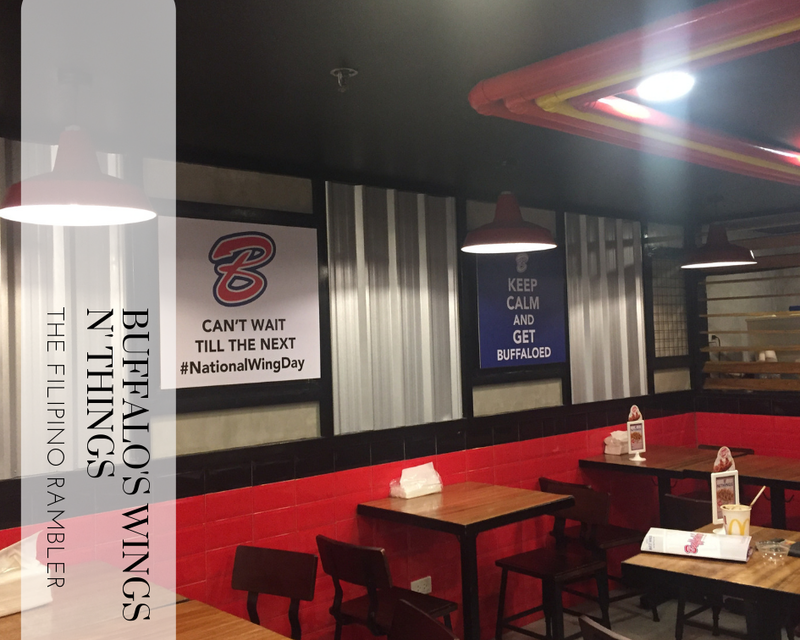 We also chose 6 sauces: Jalapeno Cheddar, Honey BBQ, Garlic Parmesan, Sriracha Garlic, New York's Finest and Firehouse Classic. 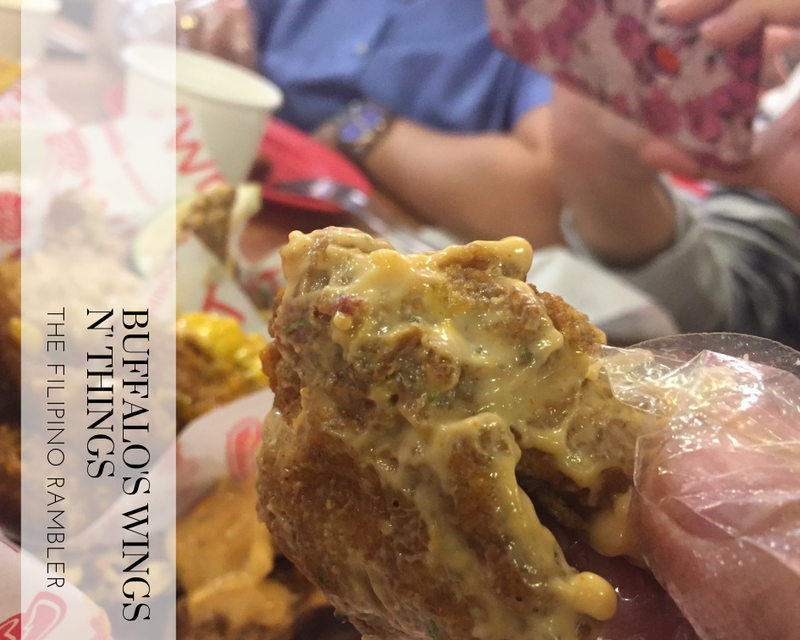 We really didn't like anything too fiery, but if you're looking for something spicy, you may choose the Ultimate Wingsanity. My personal faves include Jalapeno Cheddar and Garlic Parmesan. You see, I'm a cheese monster. The Firehouse Classic has a subtle spicy kick and I liked it too. 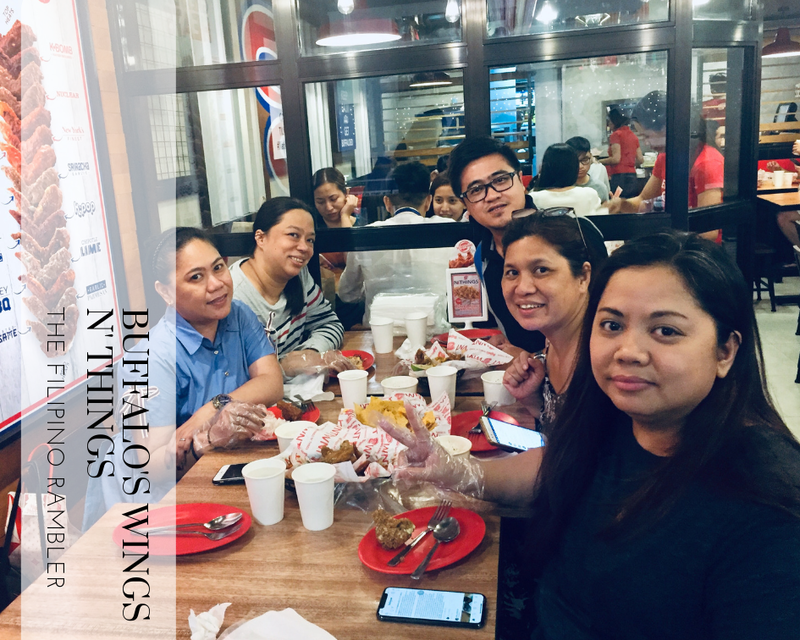 Even without the rice, the wings were heavy in our tummy. And yes, the servings were enormous, all of us five have our tummies full! 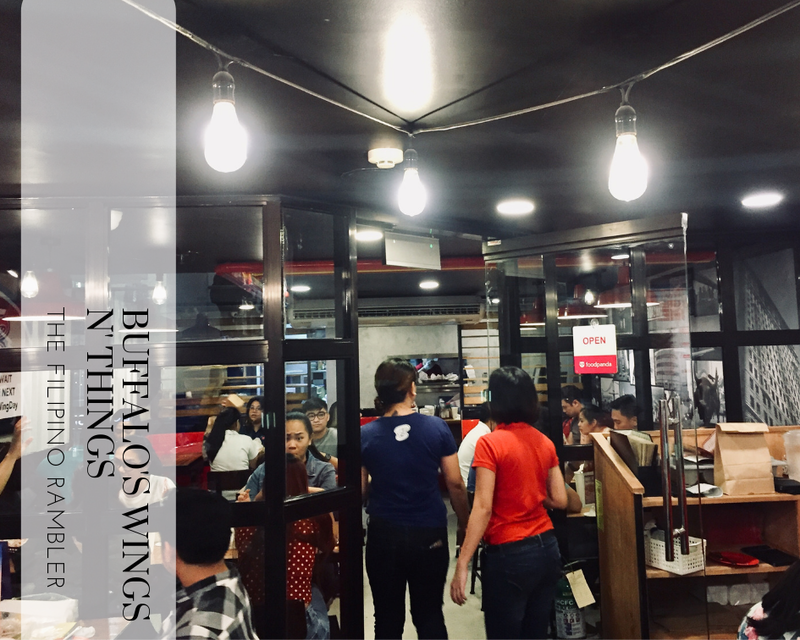 It's a small space in Glorietta Makati. The atmosphere is really inviting and I can tell everyone's enjoying their meal. 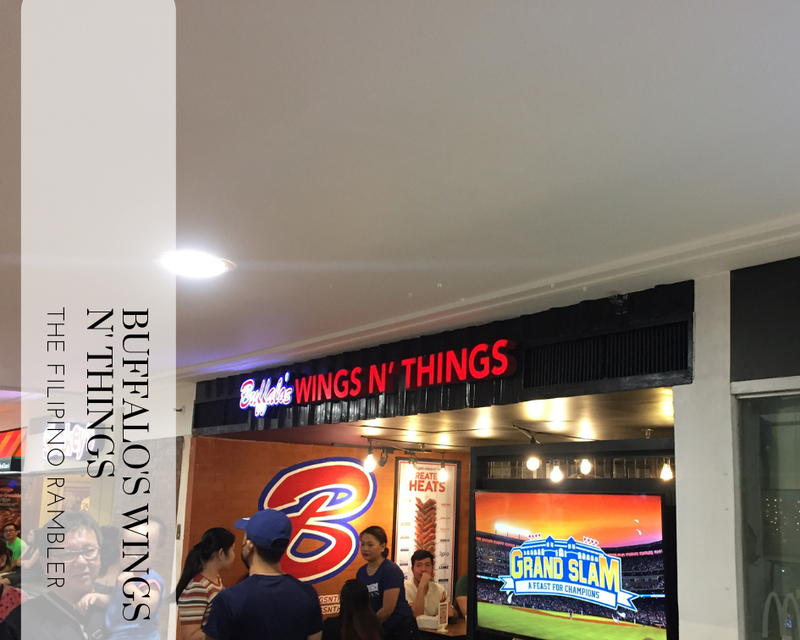 We had our cravings satisfied at Buffalo's Wings N Things. The Grand Slam Platter was a perfect idea, we were able to try 6 out of the 12 sauces. 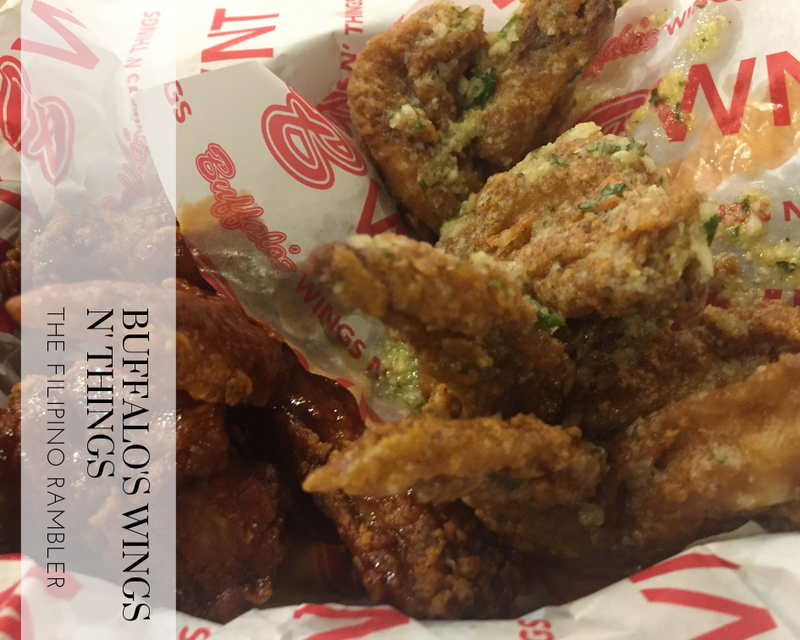 I've tried a lot of buffalo wings already, some super small, but theirs is adequate in size. I find some sauce of the BWNT lumpy, but over-all I am satisfied. We shelled out not more than 200 pesos each for the meal and I guess that's a really nice value for money. We will definitely be back. The easiest way to go to Glorietta is via MRT. Take the MRT to Ayala Station. 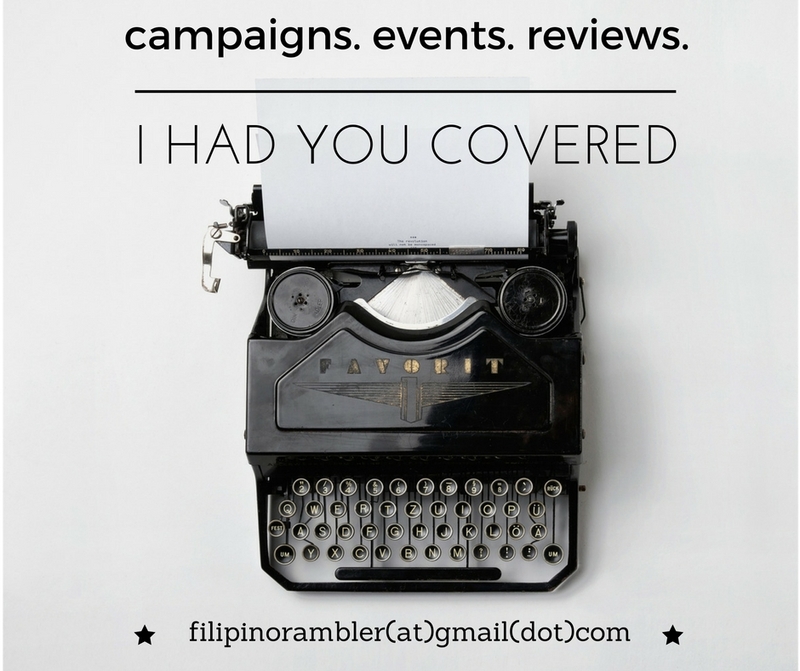 Walk towards SM until you reach Glorietta. Take the MRT to Ayala station. Glorietta is directly connected to the MRT-Ayala Station.